Andy Samberg and Andre Braugher in Brooklyn Nine-Nine, reviewed. Andy Samberg and Andre Braugher are an odd couple in Brooklyn Nine-Nine. In September, American kids go back to school, and, if the broadcast networks have any say about it, American adults ages 18–35 head back to the couch. In the next three weeks the five major networks will shower viewers with more than 30 new shows—dramas and sitcoms, shows about fatherhood, motherhood, adultery, disability, Ichabod Crane, Mary Queen of Scots, Robin Williams’ continued capacity for manic monologues—that are all jockeying for attention and ratings, limited commodities both. It’s a crazy way to do things, like spending huge amounts of time and money all year individually crafting dozens of Nerf balls, then throwing them at people’s heads hoping they will catch all of them, just because that’s what Nerf-ball-throwers have always done. The system’s bad for viewers, the shows, and even the networks. Its one saving grace is that, like a big Nerf barrage, it can be fun: a too-much-at-once, invigorating-by-sheer-volume, never-boring stream of new series and plots and actors and jokes desperate for your attention. I began to watch the new season with enthusiasm: What wonderful new TV shows are waiting for me! ABC may have learned nothing about naming shows from Cougar Town, but Trophy Wife is pretty funny! The Millers has a lot of fart jokes, but at least Margo Martindale is absolutely killing it! NBC’s Blacklist starring James Spader feels competently plotted and assembled! But as I slogged onward, I could not keep up the inner exclamation points. The metaphorical sands shifted under my feet and I had to admit I was crawling through the TV desert desperate for an oasis—you know, a show that was not abjectly horrible. I love television. It does not make me happy that the new fall season stinks. And yet, there it is, stinking. Gagging on Fox’s Dads, trekking through scrublands of series that at best will grow into cacti—shows it will always hurt to touch—I found the term “fall’s best” taking on an amended meaning, one that means not great but with potential and not wholly mediocre. Enter Fox’s Brooklyn Nine-Nine, which is certainly one of the fall’s best shows. It is not even good yet, but, lo, there may one day be water there. Brooklyn Nine-Nine has great sitcom credentials: It’s the creation of Parks and Recreation showrunner Michael Schur and longtime Parks writer Dan Goor. It stars Andy Samberg as Jake Peralta, a cop so good “the only puzzle he hasn’t solved is how to grow up.” Peralta works at a precinct in Brooklyn, joking around, ignoring regulations, and cracking cases. 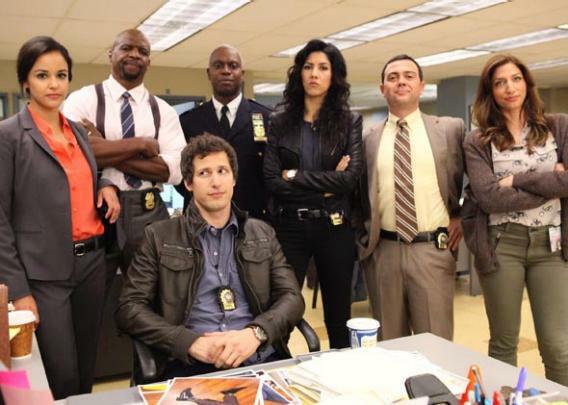 The large supporting cast includes Melissa Fumero as a female detective he’s constantly flirting and competing with; Chelsea Peretti, as a civilian administrator with a great off-speed growly space-cadet lilt to her line deliveries; Terry Crews as a mountain of muscle with the nerves of a scaredey cat; and, above all, Andre Braugher as Captain Ray Holt, an upright, uptight, authoritative boss new to the station who also happens to be gay. Braugher starred in a show last year, Last Resort, in which he played a rogue naval captain, a man so terrifyingly no-nonsense he detonated a nuke off the coast of D.C. to make a point. He plays Captain Holt with almost identical gravitas. It’s an on-paper joke—the show’s super straight man is also the gay guy—that actually works. If Holt’s seriousness, his demanding expectations, and his perpetual deadpan don’t typically make him laugh-out-loud funny (though believe me, hearing Andre Braugher say “meep morp” like a robot has its charms), they make everyone around him funnier. Samberg has a welcome not-trying-too-hard vibe, like a real leading man, in part because it’s easy to play off Braugher without mugging. Being just a little casual, a little jokey, a little indifferent to the rules makes you a lot looser, sillier, and rule-defying than Andre Braugher. Brooklyn Nine-Nine isn’t uproarious yet, but pilots, even of good sitcoms, rarely are. (It took Parks and Recreation an entire season to figure out its tone.) What Brooklyn Nine-Nine has, unlike many of the other new fall comedies, is intelligent design. The characters aren’t just archetypes, they are twists on archetypes. Braugher’s not just the macho boss. Samberg’s not just the reckless detective savant. Peralta’s love interest is also his rival. The klutzy, loser detective (Joe Lo Truglio) is good at his job. The first episode pivots around a stolen Iberico ham worth $6,000, suggesting the writers are well aware Brooklyn is currently well-stocked with punch lines. And the show has already made some necessary adjustments: An early edit of the pilot had a whole scene, jokes and all, taking place in front of a corpse. Grisly homicide is not that funny. The final version of the pilot dropped the scene and flits over the murder aspect of its case as quickly as possible. Hopefully the Nine-Nine will stick to solving pettier crimes in their future, which, unlike most of the other new fall sitcoms, promises to be funny.